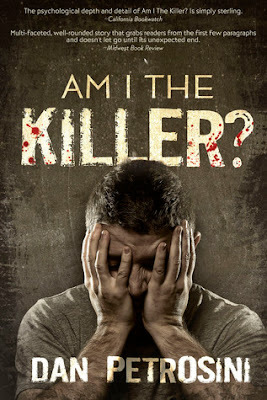 Margaret Reviews Books: Book Review | Dan Petrosini | Am I The Killer? Title: Am I The Killer? Synopsis: The juxtaposition of Peter's first person world with a third person investigator's efforts creates a satisfyingly multi-faceted, well rounded story that grabs readers from the first few paragraphs and doesnt let go to the unexpected end. - Midwest Book Review A brain-injured veteran is arrested for murder soon after he returns home to New Jersey from Afghanistan. Peter has a motive. The murder victim bullied Peter throughout his youth, and, on the night of the murder, Peter discovers the bully has stolen his fianceé while Peter served overseas. Determining the truth about what happened that fateful night is complicated by Peter’s brain injury, as it either prevents him from recalling events or provides him with the perfect cover. Detective Luca, in the midst of trying to salvage his marriage, leads the investigation but does not believe the Marine had a role in the killing and pursues other leads as political pressure to solve the case rises . However, evidence develops and even Peter’s brother, Vinny, who dropped everything to help his injured brother recover, begins to question Peter’s guilt. After Peter's arrest, his lawyers, faced with a client either unwilling or unable to assist in his own defense, recommend he cop a plea. Detective Luca attempts to move on but is haunted by an old case that fuels his obsession to determine the truth about what happened that night. Review: This is an excellent book that I got completely lost in from the first page. I finished this book on the same day that I started reading it and I felt like I was a part of the story and not just a outsider reading into the story. In the near future I may treat myself to the paperback copy of this book and read it again and again. I would recommend this book to any avid reader who is interested in crime and mystery stories.